Tangata O Le Moana, edited by: Sean Mallon, Kolokesa Māhina-Tuai, and Damon Salesa. Te Papa Press, 2012. Using a fresh perspective, this award winning and lusciously illustrated book seeks to reposition and reframe Pacific Island people and history within a new context, which moves beyond past traditional (mis)representations and omissions. Whilst the book does not profess to be a comprehensive history of the Pacific, the collective combination of fifteen essays written by well known (Anne Salmond, Janet Davidson, Peter Adds) and newly emerging authors, represents the intertwining of the people and historical narratives of Aotearoa New Zealand and the Pacific Islands. Uniquely, Tangata o le Moana puts the Pacific Island viewpoint at its centre, using a diverse range of historical and contemporary published and primary sources including: oral histories, theses, photographs, AHJRs, newspaper & magazine articles, exhibitions, online social media sites, archival documents (from NZ & overseas) and maps. Themes are wide ranging, including: archaeological origins, communication, armed forces, racial tensions & unrest, politics and sport. 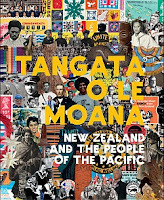 Find out more information about this book, which is available at Auckland Libraries.